When working with a rubber compounder, make sure they can provide proprietary rubber compounds and/or work with you to enhance and perfect your recipes. Leading elastomer compounders, such as HEXPOL, are committed to delivering value and helping you improve the products you make. Can your compounding provider deliver the following? As a leading elastomer compounder, HEXPOL delivers these benefits and more, including the latest in formulation development, mixing innovation, and technology. That means optimum finished rubber products and superior value for our customers. Manufacturers of rubber components require compounds that meet exacting performance standards. They need custom mixing and formulation development to meet evolving requirements and new opportunities in their diverse industries. 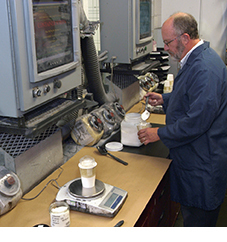 Rubber Compounding – HEXPOL has multiple primary compounding lines at facilities around the world. In North America, we have nearly 30 mixing lines, six mixing mills and more than 440,000 metric tons of working capacity. Click here to download a copy of our organic rubber compounding capabilities brochure, HEXPOL Compounding: A Material Difference. To ensure the highest quality compounds, comprehensive life cycle testing is critical. Not all compounders have this capability. HEXPOL Kennedale has over 20 different testing stations – including physical properties, analytical, and life cycle testing – with standard tests for every compound. We also have testing equipment specifically designed for HEXPOL Kennedale. Click here to download a copy of our new brochure: The Perfect Roll Model for the Roller Market. Custom Tire and Toll Compounds – Can you count on your compounder to get you needed compounds if there is an emergency at your tire plant? As a leading and large compounder, HEXPOL's Tire and Toll professionals can manage and deliver quick turn-around with emergency compound volumes exceeding 500,000 pounds per day. We've proudly partnered with the tire industry for over 40 years, providing compounding for cars, trucks or buses, airplanes, mining, off-highway vehicles, or non-pneumatic solid tires. Click here to download a copy of Tire-Toll Compounds. Retreading Solutions – With Robbins LLC as part of the HEXPOL family, we are the global leader in outside and inside envelopes, curing tubes, retreading accessories, and rubber compounds for tires. We have an array of shapes and sizes, especially for trucks, heavy equipment and aircraft. HEXPOL Accu-Fit CMT® envelopes set the standard in the retreading industry for quality and service life, lowering your cost per cure. Click here to download a copy of Retreading Products from Robbins LLC. Outsourcing – Why mix your own compounds when a full-service compounder can do it better and more economically? That's a question you should study when looking for ways to improve your product quality and strengthen your financial position. Consider the strategic, operational, and financial advantages of outsourcing your rubber mixing. Strategically, you can concentrate on your core business while leveraging the competitive advantage you gain with the mixing, formulation development, and technology provided by a leading compounder such as HEXPOL. You can focus on your own innovation, productivity, and profitability. Operational advantages include production flexibility, controlled labor costs, reliable raw material supplies, and access to rubber compounding specialists. Financial advantages include eliminating capital investment for compounding equipment, reducing inventory and equipment maintenance costs. Click here to download a copy of Outsourcing Your Rubber Compounding.